About ten thousand members of the opposition Peoples Democratic Party, PDP, in Edo State including former National chairman of the Association of Local Governments of Nigeria, ALGON, Felix Akhabue, yesterday defected to the APC in Edo state. 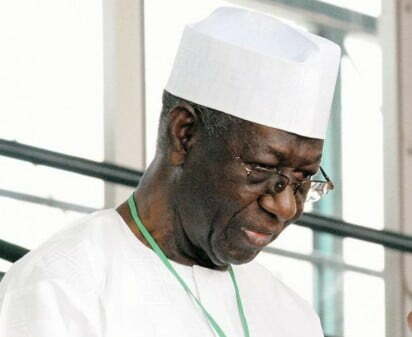 Akhabue popularly known as Joefel and former political foot soldier of the former chairman Board of Trustees of the PDP, Chief Tony Anenih, said they decided to quit PDP so as to attract development in Esanland and due to the developmental strides of Governor Obaseki. The State governor, Godwin Obaseki declared that the APC will have 1.2 million votes from the state in the 2019 general elections, asserting that the chairmen and councillors of the party for the Saturday Local government elections will reciprocate the developmental strides of his administration in the 18 Local Government Areas. Speaking the immediate past governor of Edo state and leader of the party in the state, Comrade Adams Oshiomhole urged the people of the state to reject the PDP come 2019, “since they said Local Government election is too small for them¨. Oshiomhole, who addressed the mammoth crowd, said, “we are here to reinforce the power of the broom so that it can continue to sweep and sweep and the dirts across the country particularly in our state in those bad days of PDP misrule. “The broom is just getting better and stronger. Ten years ago, around this time, we made a promise that the beginning of our struggle require that we eradicate godfatherism in our polity. “And we say we have to dismantle the PDP rigging machine. On this ground in this stadium, we launched one man one vote. On December 16, 2007, in the name of local government, PDP roll out the armed forces, they roll out the police, to ruthlessly rig local government election. “We fought them but with the power of the armed forces, they stole the election in the 18 Local Government Areas. ¨And I said, in this state, in the name of God and our ancestors, I said we will work to liquidate and banish the system that oppressed our people. For me it is a thing of joy that that machine that deployed those forces on December 16, 2007, today with their leaders alive and all of us alive, that party called PDP is dead” he stated. The mega rally was held at the Samuel Ogbemudia Stadium Benin City. It was to end campaigns for the Local government Council election scheduled for this Saturday, March 3 2018. The well attended rally was attended by the National chairman of the APC, Chief John Odigie-Oyegun, Deputy governor of Edo state, Comrade Philip Shaibu, Deputy Governor of Ondo state, Àlfred Agboola Ajayi, Vice chairman South South of the party, Mr Ntufam Hilliard Eta, Cairo Ojougboh, Minister of Youths and Sports, Solomon Dalong, former governor of the state, Prof.Osarhiemen Osunbor, National Auditor APC, Chief George Moghalu, former Deputy governors of Edo state, Rev.Peter Obadan and Dr Pius Odubu. Others are Senator Francis Alimikhena, Secretary to the Edo state Government, Osarodion Ogie, Senator Ehigie Uzamere, Ehiozuwa Agbonayinma, Mathew Iduoriyekenwem, Prof.julius Ihonvbere and many others.